UPDATE: you can now watch my review video where I compare the SPL Dome Port and housing system with the KNEKT GPLT trigger system. The only advantage I can see to the huge dome would be getting over/under shots, as I mentioned in my post on the subject a big dome is an advantage as it makes it much easier to get the 50/50 above/below water angle, and the surface line stands out more too. I love shooting video with my GoPro Hero 3+ Black edition, and you can certainly get decent underwater video with the new Hero 3 cases (with the flat port as standard), but it’s a fixed aperture lens, so it effectively shoots in aperture priority at f2.8, and because it’s such a tiny sensor bumping the ISO up kills the image quality more than it would on a DSLR, so naturally you end up with ISO 100 and a slow shutter speed for any sort of photo with low light. Slow shutter speed for video is mostly a good thing, that’s why you use an ND filter to shoot in bright light and keep the shutter speed at twice the frame rate. Maybe if they did a firmware update to allow you to prioritise a high shutter speed over ISO it would be better, but then you’d have noisy images nearly every time. If you want to shoot over/under in good light and don’t have the money for a DSLR, fisheye and housing, this is perfect. Otherwise, it’s less practical than just using the standard housing that comes with the GoPro, or one of the other pistol grips that I mentioned in my post a little while ago. His Iam a photoghpher and I want to buy one of your dome mounts how do I go about buying one? I noticed in a picture they had one dome on top (for the camera) and one below…would that be for a light? Does the dome at any advantage to traditional underwater photography/video? Can you send a link to the photo with two domes? I can’t see any photo’s on the SPL site which show anything like that, the photo in this post is shot with a reflective surface underneath so you can see the reflection of the one dome underneath, maybe you saw a similar type of image? I don’t think there would be any advantage to having a light in a dome port (as opposed to just having the light in whatever housing it’s normally in), but I might be wrong, send over the photo and I’ll do some more research and see what it could be for. 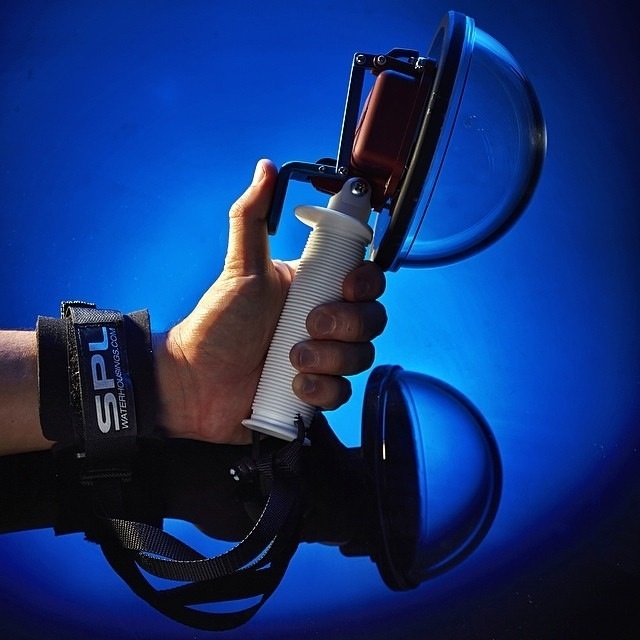 In my experience the dome doesn’t offer any advantage to shooting photo or video underwater with the GoPro, in fact there are a few disadvantages, it makes the whole set-up much more buoyant so it’s harder to manoeuvre smoothly and you’re much more likely to scratch the large dome than the small front element of the GoPro housing or instance. There are advantages to a dome port when shooting photo or video with a camera and wide angle lens that isn’t fixed focus, aperture or focal length (you can’t change any of these things on the GoPro), as it allows you to get closer to your subject, thus allowing you to light it more easily (very important underwater) and gives you a wider field of view than a flat port. From a surf photography perspective I’m pretty sure the only thing a GoPro dome port allows you to do is make over/under shots a lot more easily and dramatically, anything else is easier to do with the regular GoPro housing.